Sculpture in Stone (MFA), no. 366; Sculpture in Stone and Bronze (MFA), p. 115 (additional published references); Highlights: Classical Art (MFA), p. 176-177. This fragmentary marble statue depicts a popular legend in which the youthful Hercules strangles a pair of snakes. 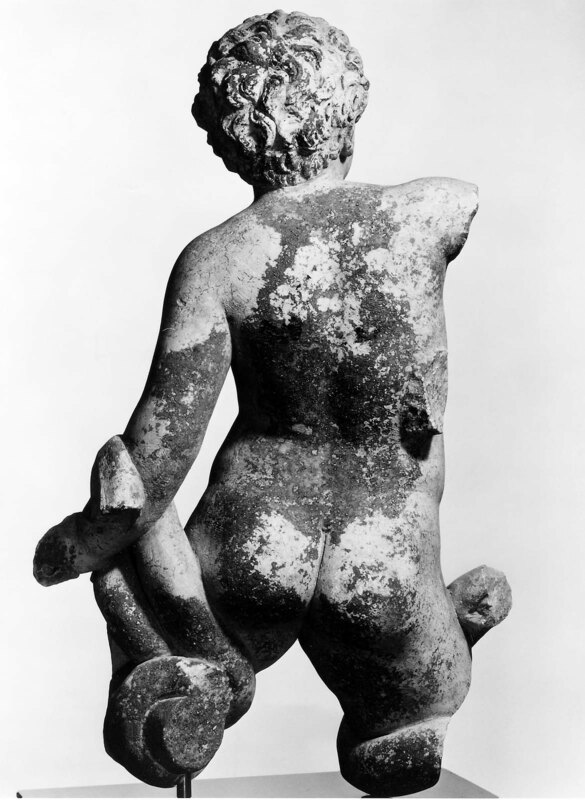 The pose is related to the sculpture of Laocoön now in the Vatican Museum. The boy’s hairstyle matches that worn by the Commodus (reigned A.D. 180-192) on coins minted in his mid-teens (from about A.D. 176), leading most scholars to consider this statue a mythologizing portrait of the prince. 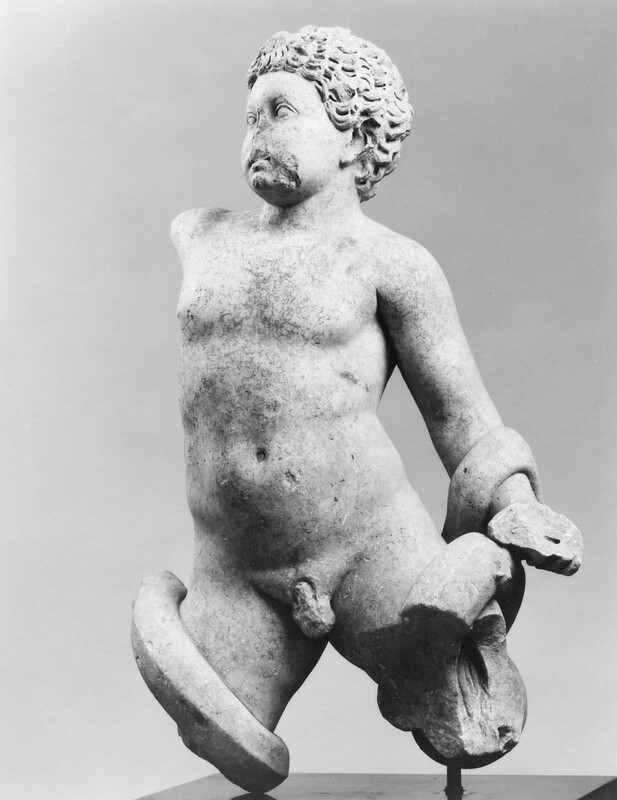 Debate remains regarding the date of the statue, which may have been commissioned either when Commodus was actually a child, or later in his life in an attempt to impart a heroic dimension on his boyhood. 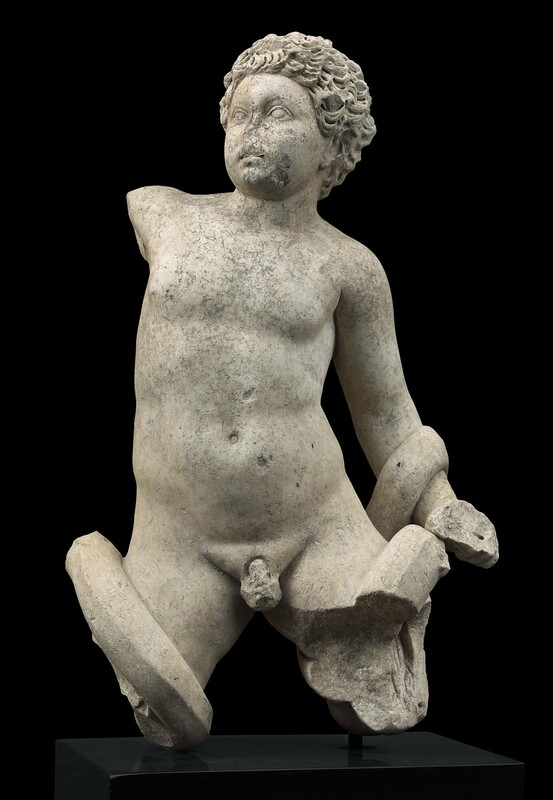 The missing right arm was raised, and there are remains of small dowel holes or pins in the left hand, the leg, the right thigh, and at the rear. The sculptured surfaces, which are in excellent condition aside from the self-evident breaks, are covered with an even deposit of small root marks; the coloring is now a light gray to yellowish brown. Harvard Lab No. HI733: Isotope ratios - delta13C +2.07 / delta18O -2.13, Attribution - Carrara, Justification - White, fine grained marble. NOTES:  According to dealer Heinz Herzer at the time of acquisition. According to curatorial statements at the time of acquisition, this sculpture had passed through private German collections and had been exhibited in museums in northwest Germany.